Coriander is one of the most commonly used herbs in Indian and Goan cooking. It is also called cilantro, or Chinese parsley and belongs to the family of Apiaceae. It has a strong aroma that wafts through kitchens. The featherlike leaves and the seeds of the plant are what are normally used in cooking. Coriander is noted for its healing abilities, which is another reason for the generous use of this fragrant herb. Coriander has anti-inflammatory properties with the presence of cineole (one of the 11 components of essential oils) and linoleic acid. Therefore it can be useful in cases of rheumatism and arthritis. 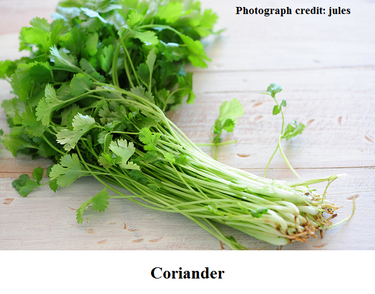 For people with kidney problems, coriander can act as a diuretic and help relieve retained water. The herb's antifungal abilities make it a useful medicine against fungal infections like eczema. Recommended for digestive troubles, coriander’s essential oils have antibacterial and antifungal properties that can combat diarrhoea brought on by a bacterial infection. It is effective against nausea as well. The wealth of acids it contains, including ascorbic acid and oleic acid, can play an important role in lowering LDL, or the bad cholesterol in your blood. Consuming coriander can avert life threatening conditions such as arteriosclerosis, heart attacks and strokes. The herb's antimicrobial and antiseptic elements render it an excellent mouth ulcer healer. It is rich in iron and hence beneficial to those suffering from anaemia. A potent source of calcium and other bone strengthening minerals, coriander is a good safeguard against the effects of osteoporosis. Because of coriander’s stimulating effect on the endocrine glands, it is able to increase insulin levels and help diabetic patients. Its antioxidant properties allow it to benefit the health of eyes and skin. Studies show that it has some anti-carcinogenic properties. Coriander should not be consumed in excess as it could have negative effects such as skin irritation and susceptibility to sunburn. Ingredients: 4 medium size brinjals, 1 ½ tsp of concentrated tamarind juice, 1 tsp of mustard seeds, 1 medium size onion, 10-12 curry leaves, 1½ tsp of ginger-garlic paste, 1 tsp garam masala, ½ tsp of turmeric powder, salt to taste, and 1 tbsp of oil. Preparation: Heat the oil in a saucepan and let the mustard seeds split. Add the curry leaves and finely diced onion. Sauté the onions till translucent and add ginger-garlic paste. Sauté the ginger-garlic paste for a few seconds and add the garam masala and turmeric powder. Mix for one minute and add chopped brinjal (medium size pieces). Add salt, concentrated tamarind juice and some water. Mix well and cook for 25-30 minutes. Ingredients: Coconut milk from 1 medium sized coconut, 1 tsp of Kashmiri chili powder, 2 tsp of turmeric powder, ¼ tsp cumin seeds/ powder, ¼ tsp of dry mango powder, 2 medium size pomfrets, one small onion, 1 clove of garlic, 1 tbsp of oil, and salt to taste. Preparation: Finely chop the onion and sauté until translucent. Add the crushed garlic and cumin seeds or powder. Stir for a few seconds and add the chili powder and turmeric powder. Continue stirring the mixture for a minute or two and then add the coconut milk. Keep stirring and bring to the boil. Add some water to thin it out a bit. Most of this extra water will evaporate as the curry cooks. Once it comes to the boil, add the dry mango powder and stir slowly. Let it cook for 15-20 minutes on a low flame, stirring the mixture occasionally. Add cut pieces of pomfret and cook on a high flame for 5 minutes and turn the gas off and leave the dish to rest for another five minutes before serving. Excessive perspiration: A mixture of 2 tsp of honey and 2 tsp of apple cider vinegar in a glass of water should be consumed on a daily basis, every morning, on an empty stomach to see positive results. Insomnia: Dilute a mixture of 2 tsp of juice taken from fenugreek leaves and 1 tsp of honey in a glass of water. Have this every day before going to bed.